Description: ***PLEASE READ*** We recommend that Next Working Day shipping is selected if purchasing this product. We do not recommend ordering this item if delivery is outside 'UK Zone 1'. Please note that we may hold the dispatch of your order, if delivery falls across a weekend, to ensure that this item reaches you in the best condition. Mooncakes are traditionally eaten and given as gifts as part of the Mid Autumn Festival, which occurs on the 15th day of the eighth month. On this day, the moon is said to be at its biggest, brightest and most round. Allergy Advice: Contains Wheat, Gluten. Produced in a factory where cereals containing gluten, eggs, peanuts, soybeans, milk, tree nuts and nut products are also handled. 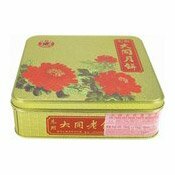 Ingredients: Red Bean (49%), Sugar (19%), Refined Peanut Oil (15%), Water (9%), Wheat Flour (Contains Gluten) (8%), Thickener (E1420), Emulsifier (E481). Simply enter your details below and we will send you an e-mail when “Red Bean Paste Mooncakes (大同紅豆沙月餅)” is back in stock!